This work differs from the composer’s other two string quintets (the apprentice work of 1861 and the mature E flat masterpiece written in America in 1893) in that Dvorák dispenses with a second viola, instead placing a double bass line beneath that of the single cello. The advantages of this are perhaps exploited best in the slow movement with its pizzicato spareness at the bottom of the texture and interweaving melodic strands above. Brahmsian richness is not the composer’s aim and one can listen to passages of the work without sensing any pointed differences from quartet texture. 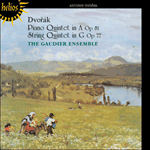 Simrock achieved a particularly acute embarrassment for Dvorák, who regarded the Quintet as his Opus 18, by receiving it (with newly made minor revisions) in 1888 and promptly publishing it without explanation as the composer’s Opus 77. The irresponsibility of this may be gauged by comparing its content with that of the Piano Quintet in A, Opus 81, composed in 1887 and published in 1888 also. The interest and value of ‘Opus 77’ reside in its internal evidence of transition towards a mature grasp of formal balance and thematic content. While by no means undistinctive, it is endearing more in generalized atmos­phere and mode of utterance than in the specifics of its melodic lines. Its presentation here beside a fully fledged masterpiece is therefore instructive. It has received more than its fair share of critical thuggery: ‘Utter lack of melodic charm … among Dvorák’s least successful works’, wrote R P Suermondt (Smetana and Dvorák, H J W Becht, Amsterdam). Alec Robertson draws bizarre comparison of the outer movements with Gustav Albert Lortzing (1801–51), the Berlin composer of comic opera, viewing the outer movements as would-be overtures. He concedes that the Scherzo is irresistible ‘even though one realizes how undistinguished the material is’ and dismisses the slow movement as ‘tortuous and dull’. It must therefore be salutary to point out a few attractions which this innocent work undoubtedly possesses. The recapitulation of the first movement sheds its opening passage but expands the middle of the exposition. The coda is particularly attractive, its final bars ideally unpre­tentious in their terse optimism. Whether con­scious­ly or not, in this movement there is a suggestion more than once of material to be found in the outer movements of the Eighth Symphony (numbered 4 by Simrock), Opus 88, composed some fourteen years later. The Scherzo, placed second, has been particularly maligned, and yet it too possesses features which in a more mature context we are ready to identify as quint­essential to the composer’s lyrical appeal. The movement is in E minor, with the result that the overall tonic of the work, equidistant from E minor and its dominant key of B minor, functions pivotally. This enables some harmonic shifts from G (heard as a temporary tonic key) to B minor, often simultaneous with recessed dynamics. In the world of contemporary popular music the term ‘hook’ is used to denote a moment which by common consent seems to stand out from its surroundings, and hence to provide a focal image by which listeners identify the aura of a particular song or ‘track’. Many of us might recognize this as relating to our private perceptions in the ‘classical’ repertoire. There is much demonstrable evidence that the interrelation of the tonic major chord and its minor mediant possesses a peculiar power over the listener’s responses; one may cite a climactic phrase in Chopin’s Piano Etude in E, Opus 10 No 3, many in elevated orchestral passages by Rachmaninov, and, indeed, the artlessly perfect second subject found in the first move­ment of Dvorák’s own most celebrated symphony, ‘From the New World’, Opus 95. Description of the phenomenon may be cumbersome, but intuitive recognition of it is often immediate and lasting, and this is the particular ‘hook’, if we borrow popular music’s perception, found in the G major Quintet’s Scherzo. Its effect may be described as preserving a smooth harmonic flow while allowing a transient wistful introspection to play across the music’s surface—something which Dvorák achieves frequently and memorably by this and other means. The Scherzo is indeed irresistible; the worst one might say of it is that its focal rhythms are a shade unremitting. Condemnation of the movement is undeserved and its neglect, along with that of the rest of the work, surprising. The third movement (Poco andante) is in C major and launches without preamble into a wistful cantilena sup­ported by pizzicato interjections. The relaxed momentum of this might be thought to hint at a somewhat similar (though sunnier) inspiration in the central stages of the slow movement of Symphony No 8. Despite the absence of any specific connection one wonders whether a residual generalized impression of the earlier, less mature inspi­ra­tion haunted the composer and reached fuller fruition fourteen years later in a more expansive guise. The late Sir Stephen Spender spoke of the impulse towards a poem originating as ‘a rhythm, a dance, or a “fury”’ before ever words accompanied it; and no less a composer than Brahms, after all, experienced regular uncertainty in the placing of his inspirations within the ideal medium. The Poco andante leans toward flat keys before un­expectedly reaching E major, by which time a prolonged but placid rhythmic continuum has developed. Greater variety is introduced in the central passage. Within conscious limits the music becomes more restive, but gentle self-containment is the order of the day; the condensed return of the opening material sets the seal on this pastoral idyll with all the interior serenity of a lazy afternoon slowly receding into the memory. Robertson’s dismissiveness is hard to understand. 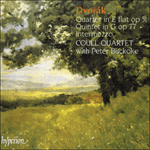 A far more gracious response comes from Otakar Sourek: ‘… one of the most entrancing movements in the whole of Dvorák’s chamber music creation’. Sourek, a passionate amateur enthusiast, produced a monumental study of Dvorák and may be regarded as the founding father of research into the composer’s life and work, though more recent discoveries render some of his research suspect and he was hindered by his lack of English when dealing with Dvorák’s great success in England and America. Contemporary researchers owe much to John Clapham’s scholarly biography (David and Charles, Newton Abbot / London, 1979). The Quintet’s finale (Allegro assai) goes straight to the heart of the matter with a busy rhythmic idea above a tonic pedal note. The theme bears a faint resemblance to that which opens Borodin’s celebrated Second String Quartet. Thereafter folk influence reveals itself intermittently through use of its highly characteristic tripartite phrase length (often created very simply by immediate reiteration of the shorter basic melody’s tail-end). Much use is made of a rising octave leap followed by a descent through the complete octave scale. The finale maintains its high spirits to the end. Here the final bars of the first movement are neatly mirrored by a cheerfully brusque cadence and an abrupt silence whose incorporation into the metrical scheme of things seems to allow the music’s character time to resonate in the mind once more before matters are truly concluded. In both this and the humour of the work’s opening we see traits notable in Haydn. The great Classical composers (following on from Vivaldi) bowed to none in their innate perception of the many properties of silence within musical design; particularly that febrile, suspended quality of silence achieved by sudden suppression of sound with its harmonic or melodic consequences seemingly still hovering, unexorcized, beyond hearing. It was to these masters that Dvorák had turned in 1859 and they had served as his models for a decade or more. It was perhaps from them, as much as from the habits of his native folk tradition, that he acquired passing felicities as well as governing principles. (It should be remembered that both Haydn and Mozart were string players used to quartet participation, a fact shown continually to advantage in their compositions in that medium.) More importantly, as Donald Tovey put it, ‘Dvorák had the Classical secret of movement, which is not a power … obtained at the expense of higher qualities, for it is one of the highest’. It is also a quality consistently evinced by the attractive G major String Quintet, whatever the music’s supposed faults. In the antics of any who could scoff as Wolf later did, one senses sour grapes; in the views of Robertson, plain misunderstanding. La différence du Quintette à cordes en sol majeur de 1875 par rapport aux deux autres quintettes à cordes du compositeur (l’œuvre de jeunesse de 1861 et le chef-d’œuvre plus mature en mi bémol composé aux États-Unis en 1893) réside dans le fait que Dvorák y remplace le deuxième alto par une ligne de contrebasse sous celle du violoncelle soliste. Les avantages de cette combinaison sont probablement exploitées au mieux dans le mouve­ment lent, avec sa figuration légère en pizzicato dans les graves et les entrelacs mélodiques qui s’y superposent. Le compositeur n’avait pas pour but d’atteindre la richesse de Brahms et l’on peut écouter certains passages de l’œuvre sans y déceler de différence sensible par rapport à la texture d’un quatuor. Ce qui fait l’intérêt et la valeur de l’opus 77, c’est cette évidente transition interne vers une expression mature d’un équilibre formel et du contenu thématique. Cette œuvre est attachante plus par l’atmosphère qui s’en dégage et par son mode d’expression que par les carac­téristiques de ses lignes mélodiques, bien que celles-ci n’aient rien de quelconque. Das Streichquintett in G-Dur von 1875 unter­scheidet sich von den beiden anderen Streich­quintetten des Komponisten (sein Lehrstück von 1861 und das reifere Meisterwerk in Es-Dur, das er 1893 in Amerika schrieb) insofern, als Dvorák auf eine zweite Bratsche verzichtet und anstelle eine Kontrabaßlinie unter der des einzelnen Cellos einsetzt. Der Vorteil davon kommt vielleicht am besten im langsamen Satz mit seinem frugalen Pizzicato unterhalb und den ineinander ver­wobenen Melodiezügen darüber zum Ausdruck. Eine Brahmssche Reichhaltigkeit wollte der Komponist nicht erreichen und man kann den Passagen dieses Werkes zuhören, ohne wirkliche Unter­schiede zur Quartett­struktur zu erkennen. Interesse und Wert von „Opus 77“ liegen in seinem inneren Beweis für den Übergang zu einem reiferen Verständnis für formales Gleichgewicht und thematischen Inhalt. Keineswegs unbezeichnend, so ist es doch eher wegen seiner allgemeinen Atmosphäre und Ausdrucks­kraft interessant als wegen bestimmter Merkmale der melodischen Linien.